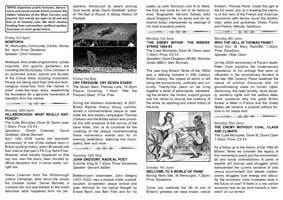 Bristol Radical History Group offers a quality blend of events for Spring 2009, covering both historical and contemporary issues. We begin with future utopian visions (Nowtopia), consider the hidden histories of seminal events of the 1980s (Hillsborough and The Miners’ Strike) and champion revolutionary thinkers who our rulers afear’d (Thomas Paine). 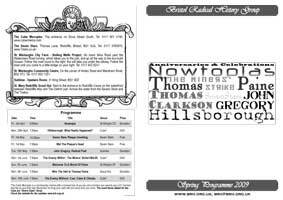 To top it all we will be unveiling a plaque on the Seven Stars Pub to commemorate the abolitionist Thomas Clarkson and the Bristol sailors who blew the whistle on the slave trade. We look forward to sharing some history, some chat and a pint or two with you. Cube = The Cube Microplex, entrance on Dove Street South. 7 Stars = The Seven Stars, Thomas Lane, Redcliffe. St WB CF = St. Werburghs City Farm, Boiling Wells Project, go down Mina Road right down to the eco-build houses, follow the road round to the right under the railway bridge and then cross the stream. St WB CC = St. Werburghs City Community Centre, on the corner of Horley Road and Merstham Road, St. Werburghs. Sublime = The upstairs room at the Sublime Bar, 31 King Street, near the Old Vic. Scout Hut = St. Mary Redcliffe Scout Hut, next to the entrance to Redcliffe caves. Opposite the Thekla and the Severn Shed. *The Cube is a membership only cinema. You will need to pay £1 for a life time membership the first time you visit. Remember to bring your membership card every time you come to an event here. Due to the Cube's eccentric door policy the times stated are 'Doors Open' times and the actual event will start about 15-20 minutes later or whenever the Cube has decided that we can start. 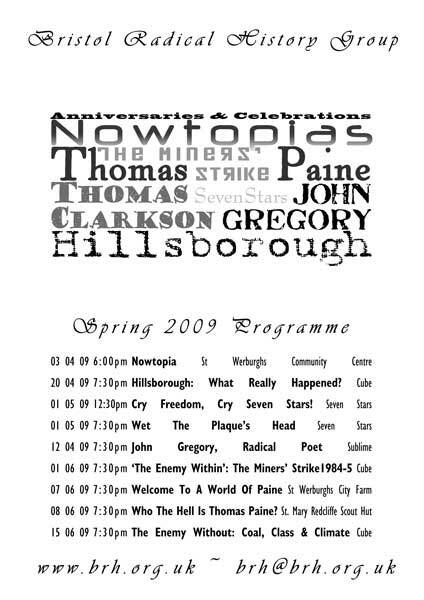 Download a printable guide for the Spring 2009 programme of events (1MB pdf file) - prints on two sides of A4 and folds into an attractive A5 pamphlet. Download a poster (650KB jpeg file) for the Spring 2009 programme of events. To preview the poster click the thumbnail below.